Glenside Farmhouse - Winterton Accommodation. Glenside Farmhouse was established in 1913 and is still owned by the founding family. 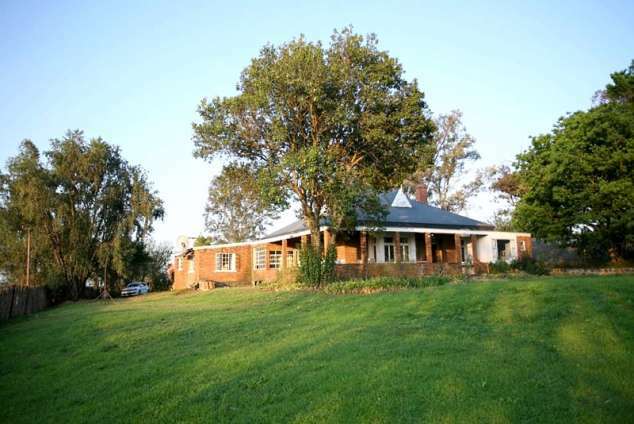 Over 100 years old, this gracious old farmhouse is situated 8 kms form Winterton in the Central Drakensberg on a working farm. It has magnificent Berg views and has old world charm with its high ceilings, wooden floors and wide verandas. Dams and river frontage leading to forests and veld and farm roads through the agricultural lands for cycling and running are all part of what Glenside Farm has to offer. The house has a spacious lounge with a fireplace and bay window. The large dining room leads off the lounge and also has a fireplace. The kitchen is fully equipped and is part of an open plan sun-room, which has a breakfast table and couch. A large scullery with dish-washer and washing machine leads off the kitchen. There are large verandas running along two sides of the house, which provide a generous entertainment area . 2. King bed and cot. 3. Queen and annex with child's bed. 4. Two 3/4 beds en-suite. An enclosed verandah has two sleeper couches, which can accommodate a further 2 people. There are 3 bathrooms. Rooms 2 and 3 share a bathroom. A braai and fire-pit are part of the large, fully fenced garden which has an electric gate. There are a number of animals and birds to be seen on the farm for wildlife enthusiasts. The Winterton/Central Berg area, in which Glenside is centrally located, offers a variety of attractions from wildlife at Spioenkop Nature Reserve, raptor shows, a reptile park - to adventure activities including white river rafting, canopy tours, horse riding, hot air ballooning and zip lining. The Drakensberg Boys Choir school is nearby, and offers world class performances every Wednesday during term time. Cathedral Peak wine estate offers wine tasting and meals. Within a 8 km radius of the farmhouse there are 10 restaurants, ranging from child friendly play areas to fine dining. 1497 page views since 13 Jun, 2018.